Juneathon 16/30 – how much do you trust me…? Thanks to a spot of oversleeping last Saturday, today was my only bite at the cherry with one particular piece of Juneathon treasure. This of course was Parkrun tourist Abradypus’s suggestion of a Parkrun t-shirt. I am now spoilt for choice as I sit equidistant from 3 different Parkruns but don’t tend to run any on a regular (or even irregular) basis. 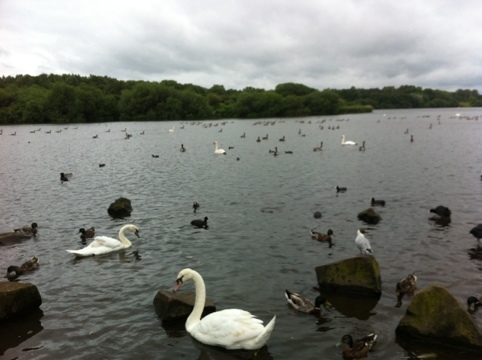 In fact, it’s a full 11 months since I ran my very first Parkrun, also at Pennington Flash. As we gathered round waiting for the pre-run announcements, I peered at my fellow runners in the hope of spotting the elusive garment. I was just toying with the idea of using a Parkrun volunteer t-shirt when my eye was caught by a flash of red. 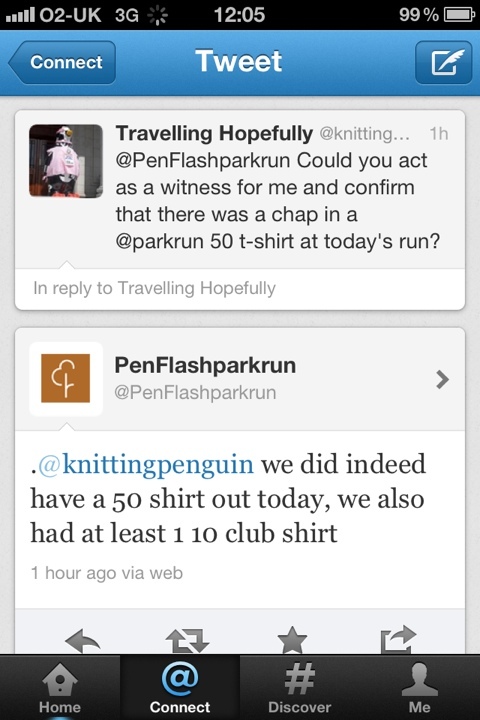 There it was, a Parkrun 50 shirt. Unfortunately I’d decided to run unencumbered so I lacked phone or camera. It was too late to nip back to my car and judging by the athletic form of the gentleman changing into his well earned prize (not that I was staring) he was likely to finish while I was still on my first lap. My only hope was that he would have a brew afterwards and not be freaked out my the red-faced sweaty woman asking for a picture. Anyway, I ran; the hills didn’t seem as daunting as last year and i was happy with myself, even though I think I was a touch slower this time. I remember that I was feeling as if I was running really well at that time last year, but it was also one of my last runs before my hip and knee turned on me and I ended up having to make friends with a foam roller and a physio. I didn’t get a photo of the actual treasure, so to compensate here is a picture of assorted waterfowl. Proof indeed! Unless you’re both in this together! It’s immaterial – my treasure got you back out to a parkrun. Job done. Well done for parkrunning. Treasure well earned! Well done on your hunting! I am a two hour drive away from my nearest ParkRun — my chances of bagging that particular treasure are vanishingly small! Unless I get on a video call with my brother, who’s a ParkRun 50’er….